Interestingly, the massive lead in restof the south has shrunk to 5…but in Mid/Wal there is suddenly a mere point in it. Economy, Pensions & Health are the issues most likely to affect individuals, while Economy, Immigration & Health are the perceived issues affecting the countr(ies). This is the bigger end of the Lab score and the lower end of the Tory. If they move any further apart it would be worrying for the Tories, I think. Can Lab break 45? Will we see any Con below 30? Are the LDs being overscored? Or given the lack of prompting, UKIP underscored? Apologies if this has been discussed in the past ,but if UKIP were prompted, what would be the expected effect on their poll rating? And how much does it tend to add for those that get prompted? Great informative article (again). And the graphic conveys so much. Re latest YG poll – probably MoE for Lab lead. Nothing out of the ordinary. However, I guess Cons will be happy the lead is not increasing (it’s remarkably stable) as they retain faith it can be overturned by the next GE. Lab supporters will be happy the lead is broadly stable, and nothing it seems LD or C can do eats into it permanently. LD supporter(s)…I can’t find anything for you to feel optimistic about. NC’s announcmenet abotu the rich paying more in tax seems to me designed to placate/headoff unrest at the LD conf. A bit of red meat for the activists to chew on and not sink their teeth into the leader. I think the ICM/Guardian polls look the most intuitively right to me. Up to round about now, LDs have always had something to hold out for. AV at first, later Lords reform, and various other things like the green thing in between, but as each thing fails to be delivered, there’s going to be less reason to hold out. Two-and-a-half years is a long time to put up with nothing much really to look forward to… a change of leader’s about the only thing left. A bit of red meat for the activists to chew on and not sink their teeth into the leader. Conjures up visions of Cleggburger and chips! How many activists are there left anyway? Does anyone have the latest membership figures for LDs ? What’s this? A 12% Labour lead? It’s time I ran that nice warm bath again! Do I detect the merest hint of a little sarcasm here? How many activists are there left anyway? Now there’s a thing. Presumably given the exodus of leftie LibDems, the remainder of the activists ought to contain a much greater proportion of right-wingers. Is this going to have an impact on campaigning? Would right-wing Lib Dems feel more comfortable targetting Tories? Or be more effective at it? No. I think both parties are unloved, and I have never quite believed that over 40% love Ed and his team, at least so far. Capital withdrawal from Spanish banks hit a record 7.5% of GDP in July, mirroring the same pattern as pre bail out Greece, while Portugal saw shrinking tax revenues and seems certain to need another bail out soon. Everywhere you care to look, conventional austerity has failed. Entirely expected, utterly predictable, and thoroughly depressing. The UK example being the most depressing, as we really did have a swathe of alternative paths to take, but chose to ignore them in favour of a sterile ideology. I’m struck this morning by the execrable press coverage that the government, and Cameron in particular, is receiving today. The July borrowing figures achieved far more news coverage than is normal for normal PBR monthly stats, and while the three previous months had also shown a rising deficit, it was the July numbers that really seemed to wake up the media world that something was wrong. At the time I pondered whether this was a turning point, and a week or so on I’m beginning to firm up in that view. The deficit was Cameron’s chosen performance metric on his own selected battleground – and he is now publicly failing. Even though I anticipated a Cameron led government being a bad experience and one that was largely devoid of principle or competence, I didn’t expect to be witnessing the smell of a dying administration just two and a half years in their first term. The scale of the internal collapse of moral and discipline is striking, and while the 2015 general election results may not seem altogether too bad for the Tory party, I expect the effects on them will be shattering. Glad you liked reading it . Yes-the conclusions must be difficult for you……….as for me ! Not sure about your parallels with Heath. All politicians have “the best interests of the state at heart”-it’s just that their policies & competency don’t always match their objectives. I’m not sufficient a political historian to find a parallel for Clegg-perhaps he is just another example of Powell’s dictum. I don’t share your affection for Heath. Yes he introduced many commendable welfare benefits, but his brief , disastrous flirtation with Keynsianism […], and failure to deal effectively with Trades Unions […] & political power play , led to ….we all know what. Heath suffered greatly from the loss of Macleod. Dunno. I have given up trying to work out what LDs now stand for. If over half of LD MPs lose their jobs in 2015 then perhaps grass roots members will have more influence, and then maybe set about rebuilding their party image? So you think old Cleggy is belatedly acquiring some cojones? I doubt it somehow; it’s more likely to be some empty positioning gesture before the Lib Dem conference. As a policy, it will come to nothing, rather like most of the “progressive” initiatives he thinks he’s foisted on the Coalition.. However, in his “wide-ranging” interview in today’s Guardian he did suggest that the boundary changes were indeed dead. He suggested that there was no point the government putting them to a vote in the Commons because “they weren’t going to happen”. So when is a parrott a dead parrott? Has the old bird breathed its last or is it a Cleggite dead parrot; merely resting. How can we ever tell with the old flip-flopper? I def think it’s all about heading off dissent/unrest at the LD conf. I’m sure LD activists will fall for this further NC nonsense. I have an image of LD activists aboard the sinking Titanic as a small group of musical instument players playing some happy clappy tune lead by their glorious leader. It’s quite often the case that parties may get away with stuff because other factors may muddy the waters and make it difficult to apportion responsibility. Tories have the misfortune of being in a position where that is increasingly not the case. They were already on dodgy ground because Labour left them with growth, but on top of that the Euro “crisis” has not come to pass and even if it does it’ll probably be too late. Meanwhile as you point out there’s not enough movement on the deficit and austerity is failing elsewhere. In addition to running out of excuses, I do wonder about the extent of impact of another factor: a change in heart towards the coalition in the Murdoch press, owing to Leveson, Cable’s supposed war on them, and the knock on effect of encouraging other media to do likewise. BBC do tend to take their lead at times form what’s hot in the other media possibly to avoid charges of bias. So when is a parrott a dead parrott? Has the old bird breathed its last or is it a Cleggite dead parrot; merely resting. Great piece of analysis by Kellner over on the YG site. I have repeated at various times since the 2010 GE that the LD leadership totally misunderstood where it’s support came from. NC’s nonsense about replacing Lab demonstrates this lack of understanding. There is only outcome when a party leader makes such a crass strategic mistake and shows such appalling misunderstanding. The sooner the party gets rid of him the quicker they can recover. 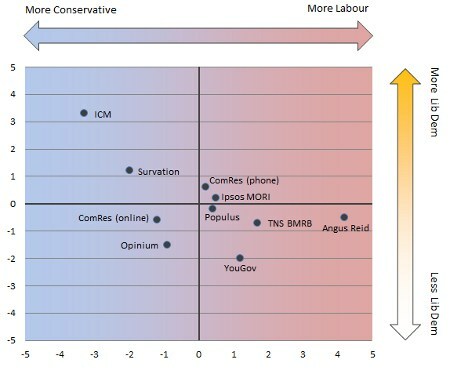 Given that ICM reallocate ‘don’t knows’ based on their behaviour at the previous election, can somebody tell me if ICM polls were more favourable to Labour (than other firms) from 2005-2010? I guess I could find out myself but I’m sure you geeks all over it already! I quite like the ICM methodology as it seems to control better for the ‘mid term blues’ or ‘swing back’, whatever you want to call it, effect. Another 12 point lead, which seems to be the top of the 8-12 current range. Non-voters 25% including the usual high-teens percentage of 2010 Conservatives, around 10% of 2010 Labour and mid-high-twenties for the 2010 Lib Dems. Government Approval was 23 – 61 = -38. I suspect the few lower figure we saw during the Olympics and after were a passing fad and we’re seeing a reversion to the previous level just ‘under’ 40. Only MoE movement on the Issues trackers as far as I can see. It is interesting to note that on two recent occasions, where Labour have had increased leads of 12%, YG/The Sun have delayed releasing the poll data. I presume that this is just allowing more time for the data to be checked ? If the poll is within the scope of being normal, within the range of 10% +/- 3%, then I am not sure why they would delay it. As for the poll, I am getting a sense that Labour might now go through a period of having larger leads and that they could well break through the 45% barrier. In regard to the cabinet reshuffle, I think Cameron will only make a few changes, with more changes to made within the junior ministerial ranks. My prediction is for Theresa May to swap with George Young. Baroness Warsi may be dropped and replaced by Michael Fallon. But that is about it. Cameron won’t replace Osborne, having only just said he will remain chancellor until 2015. But I think the Treasury minsterial team will be changed, with Laws coming back to replace Alexander. Where can I find data on electorate numbers for MoE population calculations? For example I can see Scotland’s 2011 election wiki has 1,989,222 for the seat votes and the turnout is supposedly 50%, so can estimate 3,978,444. It’s a little approximate though, and I wondered if there’s a source for the other YG areas (London, RoS, Mid & Wal, North). I assume that a sum total of the sub-areas will amount to the UK electorate. Frequency: 9%(4), 10%(3), 11%(1), 12%(2). I think taxing the rich would be a great idea, but I also think those earning over £40,000 should be taxed and contribute more too. That way, those earning over £40,000 could help subsidise tax breaks for those at the bottom (and let’s face it, £40,000+ is the kind of salary that the majority of people in this country can only dream of!) These wealthy few should contribute more than at present IMO. Neither will happen though. I agree with CrossBat – it’s just hot air and the Tories will reject it anyway, especially now the Libs are rejecting the boundaries. My predicted 45/31 is coming soon and it will be a breakthrough – provided Ed M. talks sense at the conference and the Tories keep talking …. well, Tory. Pretty close. The UK data has been fairly static now for weeks. In fact, so static that there are no outliers in the 30 Lab samples, and one outlier in the 30 Con samples (one instance of 35). This amounts to 98.3% of samples included for calculating the lead. I don’t do stats I’m afraid, I have been looking at the broadbrush headline figures, posting the odd two-week rolling average. I am not sure lab getting above 45 and the UKPA being 45/31 amounts to a breakthrough. Welcome that it would be imo for a Labour majority to be the most likely outcome this would need to be that position after the 2014 conference season. Yougov seems pretty static around a lead of circa 10 points. Nothing seems to be shifting at the moment. I think Yougov is pretty much spot on with the ‘true’ lead of around 7 or 8 points (if you take into account likelihood to vote). Wonder how Nick Clegg and the Libs refusing the boundary changes will change the nature of the coalition. Presumably it will make the Tories a bit more forceful and they won’t have to please/placate the Libs so much anymore. Why not? Not only does it do wonders for the spirits, but I also recommend the cathartic effect of adjusting any Angus Reid poll to compensate for their 6% underestimate of the Labour vote at the GE. Shame they only publish every two months or so. Still, on the bright side, given all that’s happened, is there any indication of a shy LD effect to go along with the shy Tory thing? I wonder if we don’t let the ‘shy’ tag mislead us. This isn’t so much about about some sort of love that dare not speak its name as reluctance. People, being realists, tend to vote not for the best but for the least worst option. Many of those who voted in 2010 are currently saying they are unsure or won’t both next time, but in practice most will, either for Party they find least unattractive or to keep out the Party they find worst. The Lib Dems not only have the highest level of ex-voters who are currently homeless, they are also the traditional choice of those with nowhere else to go. As you can see from last night’s poll, there are a lot of these – as is usual in mid-Parliament. you can see that the most common belief about “the impact of the Liberal Democrats on the current coalition” is that Overall, the impact of the Liberal Democrats has NOT BEEN SIGNIFICANT either way (YouGov’s caps) at 30%. Only Conservatives think it has been negative and even 32% of “Lib Dem deserters” think it has been “slightly positive”. Most of the really virulent opposition comes from Labour supporters who would never have voted Lib Dem except tactically. And even the tacticians may have second thoughts when they are effectively voting to elect a Tory MP just to spite the Lib Dems. So there are a lot of potential Lib Dem voters out there, but they are ‘reluctant’ rather than ‘shy’. It also depends on what both the Lib Dems and Labour do between now and the next election. The Lib Dems need to get rid of Clegg who is tainted beyond redemption. This might even have been true is he had played his hand very well rather than rather badly – and getting worse judging by today’s farce. But Labour also need to convince the public as well. Most of their complaints at the moment seem to be against slightly more extreme versions of policies they themselves introduced. If they don’t persuade voters that they have changed and have new ways of dealing with the country’s problems, they may find voters drifting back to the Lib Dems or failing to vote at all. The answer is you probably can’t. Only Northern Ireland seem to keep central figures for up to date electorates. If you want to work from 2010 electorates, try googling “uk general election 2010 results spreadsheet” and you’ll get loads. Pippa Norris’s site at Harvard has regions and electorates on it, though whether her regions are the same as what you want (or indeed anyone’s regions are like anyone else’s) is another matter (somewhere in a corner Martyn is gently weeping). Those recommending that Clegg be axed could reflect that, had he lost to Huhne, the latter would now be leader…………..ahem…. I voted for Huhne (environment, economy and I thought he was presentable). I just forgot about the human frailty bit but they all suffer from that. It just depends whether and when this is discovered, if ever. Think John Major and Edwina Currie. The ‘new’socialist’ Clegg voted for a 45 to 40 tax break a few months ago. The 45% was supposed to be ‘temporary’ but not that temporary. You could not make it up could you? I think to portray Heath as being responsible for the failure to deal with TU issues is somewhat unfair. he tried to bring in a sensible regime for dealing with these matters but was rejected at the polls when he asked voters to back him. What we have today was what he envisaged. In fact I believe that election was lost, as usual, on the lack of a FGF in voters’ minds. I meant 50 to 45, got a bit carried away with thoughts of marital infidelity. Your secret is safe with us ! I do agree with your comment that “you could not make it up”. “Personally I don’t think we should put this boundary thing to a vote because it isn’t going to happen,” he [Nick Clegg] said. He also said Laws will be back in cabinet after the reshuffle. That should be put a few tenths, if not an entire point onto the Labour %. The discussion as to how many LD activists are ‘right wing’ is an interesting one. ‘Not many’ from my personal knowledge. I can think of hardly any in my constituency and I have met most of them. ABT would describe them best, some being well to the left of trade union type Lab supporters, especially on social issues and environment.. Some are (were) SDP and there is indeed a ‘Stockholm syndrome’ effect described by an earlier contributor (see above somewhere). ABT is still alive and well in LD ranks. There was a small rump of people a decade ago with whom I had little in common. I decided that they were ex-Whig types as they were all well off and actually looked down on what Auberon Waugh used to call the ‘garagiste’ element of the Tory party. They are all dead or in care homes now. I can’t quite understand how our old friend Mr Laws seems to ride blithely above the MPs expense scandal as if he was some sort of victim of it as opposed to being, in fact, one of its more substantial miscreants. Where does all this ” poor old David, great loss to the Government can’t come back soon enough” stuff come from? Am I missing something? We should forgive Jacqui Smith a wry smile when she sees his political rehabilitation and likely rapid return to the Government’s front bench. I wonder if the Labour politicians who talk of taxing the rich more would personally agree to paying more tax themselves? Given their history with regards to how they treated the rich/bankers/wealthy in government and/or expenses, I guess not! Oh well….you should lead by example as they say! The Libs, Tories and Labour are all the same in that regards. As we are ‘all in this together’ will we also see Lib/Tory MPs make more personal contributions to the public purse too? I doubt it! “The Liberal Democrat MP was thought to have been a millionaire but was claiming up to £950 a month to rent a bedroom from a political lobbyist. He claimed £950 a month to give to his live-in boyfriend. His utterly laughable defence, even more laughably accepted by his HoC peers, was that he “had to claim” to hide his sexuality. Pah. Nobody “has” to claim anything, especially millionaires. Nobody ever got exposed for not claiming something. The absence of a claim is difficult to stumble over. If he is brought back, might as well Coulson come back, and let him and Huhne carry on from jail, if they should end up there. I doubt it will help them a lot. I agree there may be reluctant Lib Dems out there, but this does not mean there are not any shy ones also. If there appear to be Tories unwilling to associate themselves publically with Tory policies, then the same might well apply given their close association with said policies. Then again there might not…. I just wondered if the polling gurus had tried to measure this or take it into account. On the issue of the impact of LDs on the coalition… it may be that overall people think it’s neutral and that LD deserters think it’s slightly positive, but there are three problems with this. Firstly that being neutral or slightly positive simply means the Tories mostly got their own way. Which is nnecessarily a good thing for an LD voter. Secondly, it involved trashing the LD manifesto. Thirdly, some may accept there’s little impact on the coalition but they may have preferred no coalition at all. Not having much impact on the coalition is more of a negative than a positive, one might venture. Regarding what LDs need to do: sure, ditching Clegg is an option, but Kellner’s piece gives more information on this. Kellner split the problem up into four areas: Ideology, policies, branding and leadership. LDs have issues in all four areas. – Ideology is an issue because the left think the LDs too much to the right, and the right think them too much to the left. A difficult circle to square. – policy is an issue for a similar reason as ideology. Not a surprise since policies tend to reflect ideology, or voter perceptions of ideology are liable to be influenced by the policies. Again, the left think LDs are too much to the right because of support for Tory policies, but the right think them too much to the left again. This is what is known as being between a very big rock and a very hard place. So people don’t know what they stand for, not surprising as most don’t think they’ve managed to implement LD policies, and they don’t trust them either. – Leadership is an issue because Clegg’s polling is dire, and on several dimensions: Especially note that the polling on Clegg is worse with LD deserters. All of this is bad from the point of view of recovering the deserters, or anyone frankly. Kellner doesn’t say this, but you may note the role of trust underlying much of this. Clearly it’s explicitly the case with respect to branding and to Clegg himself, but it also impacts on perceptions of ideology and policy since at present the LDs will find these perceptions difficult to correct without trust. They may come up with a spiffing manifesto but how many would believe it? Hard to see how LDs can correct the trust issue before the election and after the election they may not get another chance to prove that they will in fact deliver on their promises. Worth noting that Labour have already ditched their leader associated with failure, courtesy of the Lib Dems. Oh the irony, and one wonders how many Lib Dems may come to wish it had been the other way around: that Brown had stayed and made Clegg resign. True since the polling suggests both Labour and Conservative supporters think the LDs have impacted negatively on the coalition and the rest don’t think they’ve impacted much at all. Great post. I’m surprised Pollsters don’t use any latent variables like home ownership, education etc… to weight probability of voting, or are there no reliable ones? Michael – housing tenure is used very frequently as a weighting variable. Education too sometimes (YouGov use education to sample by but not as a weighting variable).